Since 1986 Strong Area Health Center has been serving residents of all ages from Strong and the surrounding communities. 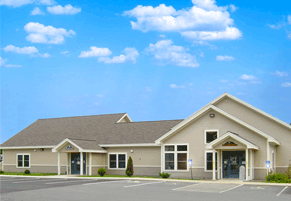 We offer both medical and dental services to area residents. Utilizing the latest technology, our professionals work together with our patients of all ages and provide a "medical home." Click here to learn more and to watch a video: Patient-Centered Medical Home. Our team includes medical providers, behavioral health specialists, a psychiatric mental health nurse practitioner, dental providers and hygienists, as well as clinical and administrative support staff offering a variety of services based on patient needs. This includes access to our dental center on site. Nestled between the Western Maine communities of Farmington and Rangeley, the town of Strong sits just north of a bend in the Sandy River. Formerly known as the toothpick capital of the world, once manufacturing over 20 million toothpicks per day, Strong is now ideal for a variety of outdoor activities including hiking, swimming, fishing at Porter Lake for landlocked salmon, trout, and chain pickerel, and snowmobiling with just a short drive to several ski locations. In addition, travelers come to Western Maine to enjoy visiting Smalls Falls, a spectacular set of waterfalls located just minutes from Strong. The snow-capped mountains, vivid fall foliage, and moose-spotting opportunities attract the young and old alike.